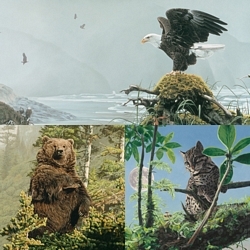 Image Size: 36"w x 15"h.
Artist Rod Frederick is a master of painting animals in their natural habitats. He captures a world full of wide vistas, soaring trees, sky-scraping mountains -- and that’s just the backdrop for his spectacular wildlife. He’s also known for using canvases of extreme dimensions, each chosen to best suit the vibrant and sweeping panorama of the Northern Rockies wilderness. “I can get so caught up in the excitement of watching elk,” says Frederick of the subject of “Homeland Challenge.” This scene, set during the mating season, is as familiar to Rod Frederick as his backyard and could be almost anywhere in the Rocky or Cascade mountain ranges. Once found all across North America, elk have historically lived in many types of habitat. They've learned how to survive with different foods, weather, cover and neighbors. Frederick’s previous fine art editions featuring elk include “The Wake Up Call,” which is Sold Out at Publisher. Don’t miss this wake up call to bring “Homeland Challenge” into your home. The serene outdoors seem at odds with the wild and crazy character of this artist, who is as famous for his paintings as he is for his sense of humor and gaudy shirts! If seen on his constant excursions into the wilds, many a collector would tell of an eccentric pirate come to life, only this swashbuckling, seemingly fearless explorer was more anxious to gain and share the treasure of knowledge rather than riches. "I grew up in a house full of pets," he says. "My mom had a degree in fine arts and although my dad was a lawyer, he was a weekend painter." So his love of animals and art was sown early (also inspired when he received a gift of Roger Tory Peterson’s Field Guide to the Birds) and he attended Willamette University with a major in art and a minor in biology. "So I could know my subjects outside and in," he says. He put that education to good use as he embarked on a fine art career that would allow him to do what he enjoyed most; explore and learn. Frederick built his house in the middle of the Oregon wilderness and filled it with birds and animals. He’s hiked and camped in mountains and forests throughout the northwest U.S., Central America and East Africa. He knows the lakes and mountains as well as he knows the plains and deserts, not to mention almost all the creatures who live there, from the smallest bird to the largest elephant. And he will paint them on whatever size canvas suits them best. In addition to his peaceful views of animals in their natural habitats, he is also known for his paintings’ many different sizes and shapes—each chosen to best suit his perfectly balanced images of wildlife and wilderness.